The Bishop of the Catholic Diocese of Uromi, Most Rev. Donatus Ogun was at Annunciation Catholic Church (ACC) Irrua from November 16th to 18th, 2018 for Pastoral Visit. On Friday, 16 November, the Priests and Parishioners converged at 4:30 pm at Bank road junction with brigade Band music coupled with cannon shots to receive their Chief Shepherd. The members of the C.W.O.N were out with their age-long dance to welcome the Bishop into the Church. The church was filled to its capacity by the parishioners of the main and outstations of A.C.C parish. The Bishop and guests having taken their seat, the Vice Chairman of the Parish pastoral council; Dr. O.D. Ikidi (KSM) read his welcome address. In his analysis, he stated that the scheduled comprehensive 3-day Pastoral visit was joyfully awaited by the faithful as all were in excitement by the presence of the Shepherd in the midst of his flock. Many of the faithful who have never had the opportunity of being with the Bishop were grateful to our Lord Bishop adding that the visit was a blessing to them. The vice chairman introduced the two outstations of the parish, St. Jude Ididigba Usugbenu and St. Michael Usugbenu, each with modern church building. History has it that ACC Parish once consisted of Agbede, Ewu, Opoji, Idumabi, Ibhiolulu, and Ujabhole communities. Now each of these communities has its own Parish/Mass Centre, a concrete sign of the growth of Catholicism in Irrua in Particular and in Esanland in general. On behalf of the Parishioners, he appreciated the parish Priest, Very Rev. Fr. Simon Peter Osinde and his Assistant Rev. Fr. Benedict Isiraojie for their astuteness in developing the Parish physically and spiritually. He wished our Bishop a joyful and happy pastoral visit to ACC Irrua. In his response, the Bishop appreciated the parishioners’ co-operative attitude. He stated that his proposed visit to Abuja was cancelled for the visit to ACC. He thanked Very Rev. Fr. Simon Peter Osinde for his developmental strides of the church. According to the Bishop, a lot of good things have been done. Against the backdrop of the several Parishes/Mass Centres that the Parish has birthed thus far, he remarked that “giving birth does not mean dying but continuous living”. The C.W.O.N and C.M.O.N gave their applauds. In response, the parish Priest appreciated the parishioners for their massive turn out to welcome the August visitor. He announced that the exercise would continue at 5:00 pm with Benediction. On Saturday, November 17 2018, at 9:00 am, the Bishop was at St. Jude Ididigba Usugbenu, one of the out-stations of the Parish and they welcomed him with their cultural dance. The donor of the new church Building; Mr. Mike Osimen was present to welcome the Bishop. The station Laity chairman, Sir Aikare Innocent (KSP) presented his welcome address. Present at the church were the executive members of the parish pastoral council and other parishioners. In his address, Sir Aikare stated that the station has the following facilities: The Church, Divine Mercy Prayer Centre, Reverend Sisters’ Convent with borehole, a very big hall with six rooms and classrooms not in use. He remarked that if the lands given by the community are in full use, the community will give out more to the church. He also appreciated and thanked our spiritual, innovative, resourceful and dynamic Parish Priest, Very Rev. Fr. Simon Peter Osinde and his Assistant Rev. Fr. Benedict Isiraojie for the Physical and spiritual development in the Parish. He also appreciated the donor of the Divine Mercy Centre, and the Church, Mr. and Mrs. Mike Osimen. The C.W.O.N president of the Outstation; Mrs. Anna Okojie welcomed and thanked the Bishop. Also, the C.M.O.N chairman Mr. Abel Uduebholo appreciated the August visitor. The next celebration was at St. Michael Catholic Church UsugbenuIrrua, where the faithful gathered in anticipation to welcome their Chief Shepherd and his entourage. In his welcome address, the Laity Chairman Hon. Pius Ogbole (Edo Chemist) mentioned some developmental Projects in the parish such as the Church building, the Rectory, the Catechist’s residence, the Church Hall and the Bell Tower. He appreciated the efforts of key benefactors like Sen. Engr. Clifford A. Ordia (FNSE), Engr. Emmanuel Imafidon, Mr. and Mrs. Owobu Obigho, and Mr. and Mrs Godwin Obigho. He also remembered those of blessed memory who contributed in no small measure to the growth of the Church. The Bishop went round to inspect the structures as soon as the welcome address was over, and subsequently reminded the Church community on the need to be actively involved in local evangelism so that the worshipping community can grow. He would want to know those who belong to the church. Kolanut presented was broken with prayer by Pa Omozejele, after which the gift items for the Bishop were presented by Hon Pius Ogbole on behalf of the faithful. At 4:00pm on the same day, the parishioners converged in the main station for an interactive session, where the Bishop responded to some salient questions. One of the issues raised was on the Islamisation of Nigeria. The Bishop doused the fear of the parishioners, stating that Nigeria cannot be Islamised. He further explained that the Knights of the Church are defenders of the Catholic faith. He then told the congregation that plans are underway to have Y.C.W.O. and Y.C.M.O. in the Diocese so that young couples can more readily identify with the Catholic Men and Catholic Women Organisations in the Diocese. The high point of the pastoral visit of the Bishop was the celebration of Holy Mass at 9:00am for the whole parish community (including outstations), on Sunday November 18, 2018, wherein candidates for confirmation were introduced to the Bishop, and later on confirmed. The Bishop lauded the efforts of the Parish Priest and his Assistant, for their good record and also expressed satisfaction for the purchase of the land at Usenu across the Benin Auchi express road. He further expressed joy over the performance of AAC old boys for the transformation of the school, noting that plans to bring the school back to the mission was in full swing. He then explained that the Catholic Church is not competing with any church and it was founded by Jesus Christ, the Universal King. In his homily, the Bishop emphasised the need for everyone to realise that Holy Mass affords us an opportunity to be in the presence of God in heaven. He further stated that on the issue of salvation, it is better to fail in trying than not to try at all. To the candidates for confirmation, he explained that confirmation makes one a soldier of God, who does not and should not run from war. In conclusion, he thanked all parishioners for the beautiful nature of the compound, reminding them that “God’s blessing is enough salary”. After the homily, all the candidates for confirmation knelt down as each received the Oil of Sacred Chrism on the forehead from the Bishop while their sponsors stood behind them, with hands on their shoulders. The final phase of the pastoral visit was at the palace of His Royal Highness, Alhaji W.O. Momodu the II J.P. (C.O.N), the Ojiruwa of Irrua, the Okaijesan of Esan Land. There, the vice chairman of the Parish Pastoral Council; Dr. O.D. Ikidi (KSM) introduced the Bishop and his entourage to the Ojiruwa of Irrua. In turn, Chief Umolu Abhulimen (Otota of Irrua Land), introduced His Royal Highness and other traditional chiefs present to the Bishop. The Bishop thanked His Royal Highness for ensuring peace in Irrua land and for his remarkable leadership qualities. He further pleaded with His Royal Highness for a parcel of land large enough to establish a project like a school. He then thanked the Royal Father for his magnanimity in warmly receiving him despite the short notice. In his response, the Royal Highness thanked the Bishop for finding time to visit him, irrespective of his tight schedule. He proudly expressed his love for the Catholic Church, even though he was now a practicing Muslim. He recalled that his faith journey began in the Catholic Church, where he received baptism. 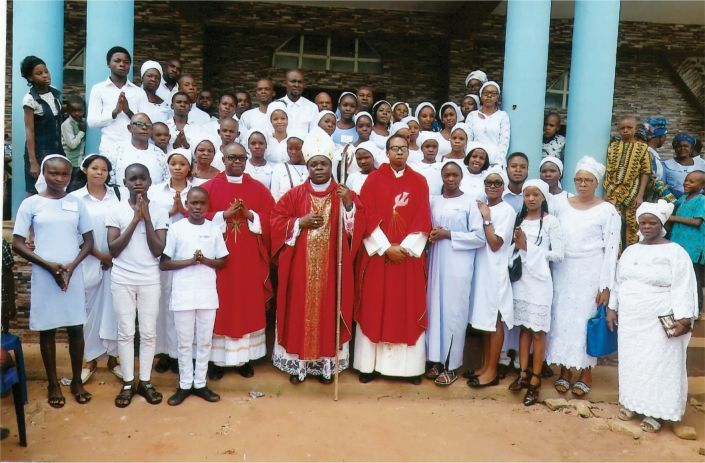 Annunciation Catholic Church, Irrua will forever remain grateful to the Diocesan Bishop Most Rev. Dr. Donatus Aimioshion Ogun for the three days pastoral visit to the parish.